COLUMBIA, SC (WIS) - Even though the kids are heading back to school later this month, not all will have the supplies they need for class, unfortunately. 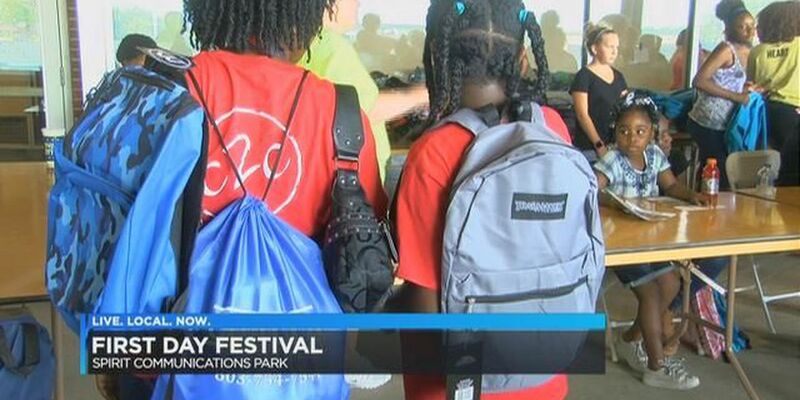 The First Day Festival at Spirit Communications Park aimed to help fix that on Sunday by offering free school supplies and services to children from all across the Midlands. Thousands of families and children lined up for the back to school bash at Spirit Communications Park. Event organizers said they handed out at least 2,000 book bags full of supplies to children, but that's not all. They also gave away free haircuts to get children school-ready and provided free health screenings. It was almost like a one-stop shop for all things back to school but for free. The non-profit organization, YNOTU2, said they have been doing this for years but decided to partner with the City of Columbia to make it happen. Last year they had 1,500 book bags, this year they were able to double that number. Organizers called this year's event a huge success. "I think it's important, not just for the financial support, but also sometimes a family just needs to know that there is support outside their family from the community," Kimani Davis, founder of YNOTU2 said. "I think by showing them not only that the community supports them, but also have the officers give the book bags away, then we create a positive interaction with the police force so that these kids can see, not only the community but that the police force and authority figures do support you as well." Besides school supplies, they had a DJ, a bounce house, and food. The Richland County Sheriff's Department and Columbia Police Department were also at the event talking with children. A lot of the supplies that were leftover will be given away in Orangeburg at a back-to-school event at a later date.